We all know what life with an eating disorder looks like, more or less. It’s portrayed (with varying degrees of accuracy) in movies, on TV, in books, and all over the internet. Less often, we get glimpses into the recovery process. I think that’s part of what makes recovery so terrifying – we don’t know what to expect. Christmas came about 6 months into my recovery process (the final time – the time I finally put the nail in ED’s coffin). I had just started eating in front of other people. I had yet to eat other people’s food. I would be spending about 48 hours away from my house – and I hadn’t even spent one night away in almost a year. I had been laid out with an illness for about two weeks prior, and wasn’t sure if I’d get to be around people (so much contagion!). I got well on about the 22nd of December, at which point I still had ALL my shopping to do. My anxiety was THROUGH THE ROOF. I packed three bags – an overnight bag, a bag of gifts, and a bag containing individually portioned meals for the full 2 days. Two identical breakfasts. Two nearly identical lunches. Two ready-to-heat dinners, and a random assortment of snacks. Everything had been carefully measured and chopped at home. It was very methodical, very controlled, very safe. I was eating enough food, but I was still going about it in a very disordered way. The first night, I think I may have traded out one of my brought-from-home bedtime snack cookies for one that my cousins had. It was a BIG STEP, but I survived. I don’t remember much about that Christmas, except for the food. I remember sitting at the table with everyone else, eating out of my tupperware containers. It felt conspicuous and awkward, but I was proud to be sitting with everyone. I had one rocky moment when, on the second day, a family member escorted one of my young cousins to the bathroom and, upon returning, announced his weight to the family. Now a) weight was on my mind, b) I knew there was a scale in the house (and I swear it was calling my name) and c) body size and shape was something everyone around me noticed, and it was important enough to be discussed at Christmas dinner. It’s hard to say, because I feel like I was walking such a tightrope in early recovery – one misstep and back into anorexia I’d fall. Ideally, I’d have pushed myself to eat other people’s food sooner, testing it out in a quiet setting so I’d be prepared to do it more on Christmas. In reality, I think it would have been enough of a push to get me to take my food out of the tupperware and use a real plate or bowl for each meal. I wish, however, I’d had the guts to challenge the weight talk, if not to protect me, then to protect my young cousin. With the exception of the day you’re born, nobody needs their weight announced to the world. The next year, I was doing much better. I was able to eat other people’s food, and only brought a few snacks with me. My cousin (who I spend holidays with) and I talked in advance to make sure there were foods I could eat available for every meal. Yes, even in recovery I had safe foods. I just wrote it off as being particular. In reality, it looked a whole lot like orthorexia. Things went well . . . until Christmas morning. I knew the family tradition was cinnamon rolls for breakfast. I knew I had my “safe” breakfast as backup. I hadn’t decided yet which one I’d choose. It turns out, the agony over making choice kept me from actually making it. I didn’t end up having breakfast at all. 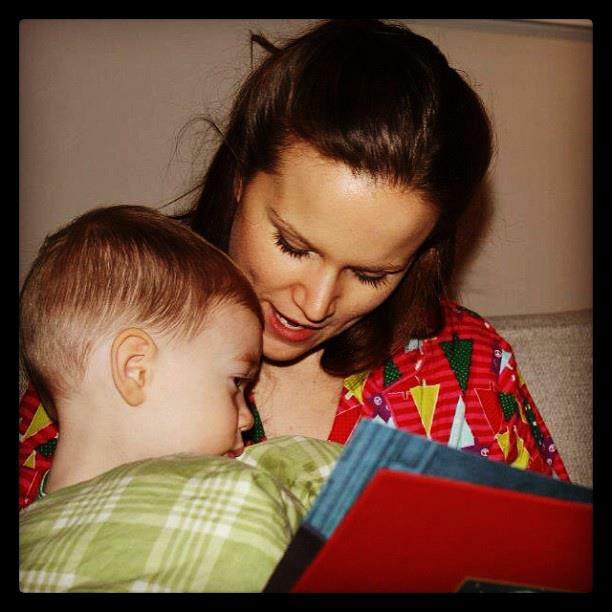 Once Upon A Christmas, Reading to my Godson. I’d have made a plan beforehand. Knowing myself, knowing that I still wasn’t good at spontaneity, I should have made a plan. Either choice would have been better than no food at all. I held off making the decision because I told myself it would be easier in the moment than if I built up anxiety preparing for eating the cinnamon roll. If I’d planned, I could have eaten a cinnamon scone a few months out, then a Cinnabon Mini Bun, then a full-blown cinnamon roll in a comfortable setting to get myself prepared. Yes, I’d still have been anxious, but I’d know that I could eat it and survive. Then I could get on with my day. Nowadays, I arrive at Christmas with something awesome I’ve baked to share with everyone. I help plan the menu because it’s fun, not because I need to know what to expect. I eat the foods I want to eat, and skip the ones I don’t. I eat candy cane ice cream because I love it, even though I know my digestive tract doesn’t. I’m the first one in line for a cinnamon bun, and I usually go back for seconds. Because I’m a human, the thought crosses my mind that maybe I’ve eaten too much. I acknowledge the thought: “Yeah, I might be a little overfull.” And then I let it go. I still eat breakfast and lunch and dinner and snacks the next day, because I know that one day of overfull will not change anything in the long run. It doesn’t dictate how worthy I am of food at any subsequent meal. There is nothing I’d do differently, because I have no regrets. I’ve spent time with the people I love, and they love me back. That’s all that matters now, in the land of recovered.